Theme seminars are aimed at reviewing specific details of aikido technique in order to deepen and organize the skills acquired at regular practice. 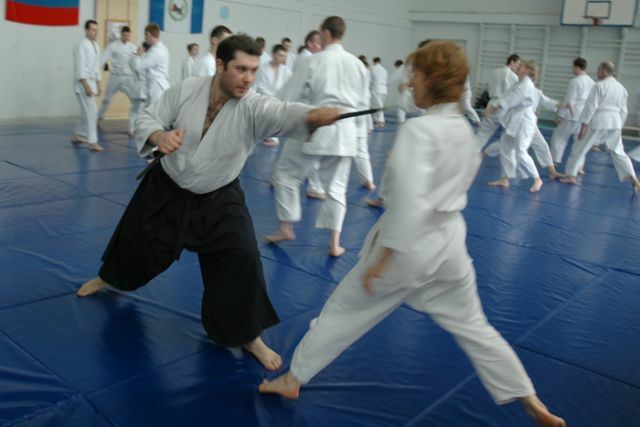 Weapons seminars are dedicated to the understanding and mastering of basic principles of weapons techniques so as to apply these principles to the movements and techniques of aikido. Test guidance seminars are conducted in small groups divided by Dan/Kyu level and focused on review of important technique aspects for the test. Theme seminars have been conducted 2-3 times a year since 2005, the program may include 1 to 4 classes, depending on the particular topic. Classes are lead by senior Koinobori instructors, the participants, numbering about 80-100, are divided into groups according to their level. Seminars in branch dojos are aimed at ensuring an ongoing and close cooperation of all Koinobori Dojo branches, promoting a common style and standards, exchanging experience among instructors and practitioners of regional and central dojos. Seminars are conducted by senior instructors of Koinobori Dojo, often accompanied by Moscow practitioners.